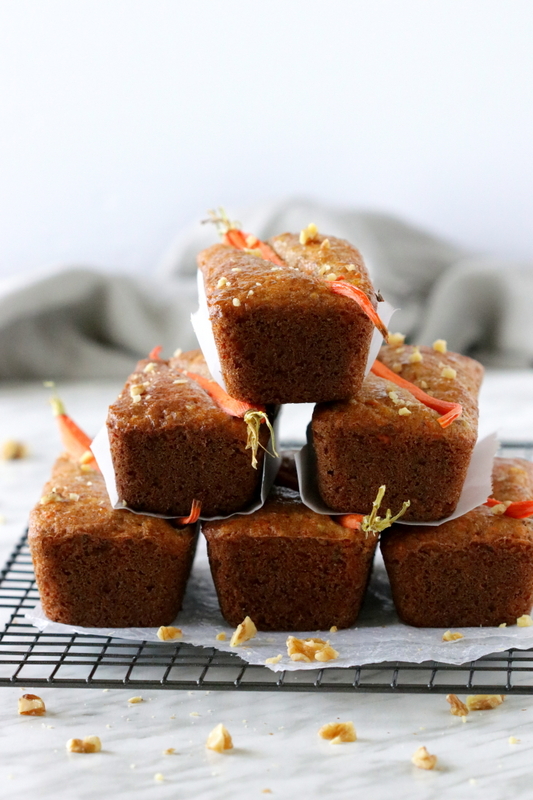 Moist and delicious Gluten Free Mini Carrot Loaves with sweet pineapple bits and finely chopped walnuts for some added texture and flavor. These little beauties are topped and baked with dutch baby carrot halves for a whimsical appeal that is sure to please your family and friends. I’m by no means an expert in gluten free baking however when you have family members who are gluten intolerant…well lets just say that meal times can be somewhat challenging. But this can be said as well for those who have other dietary restrictions. So yes it can be challenging but it doesn’t have to be boring! And most times we needn’t look any further then an old family favorite recipe for inspiration. 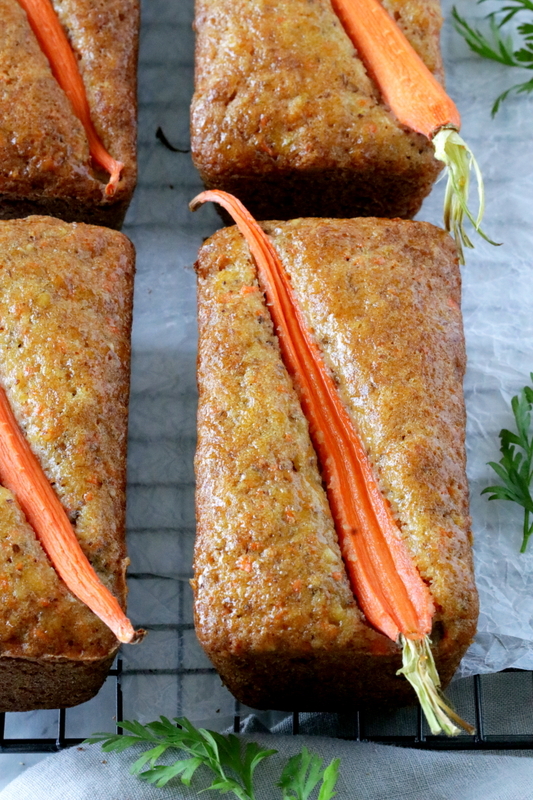 That’s how these mini carrot loaves came to be! A delightful adaptation of my two layered Carrot Cake with Cream Cheese Frosting! Which begs the question…have you tried it yet? If not you should! It’s beyond delicious! You may or may not have to apply some slight tweaks when experimenting with gluten free flours. Although some will attest to replacing cup per cup. I made a few adjustments to the recipe by decreasing the quantity of oil as this reduction worked better with the gluten free flour. This rendered the loaves slightly more dense but still moist. A consistency we’re much more accustomed to in a perfect sweet loaf. I’ve also reduced the amount of sugar by a whole half cup because…well just because. Since we’re going gluten free here today and reducing the oil, why not the sugar as well! And they turned out amazing! 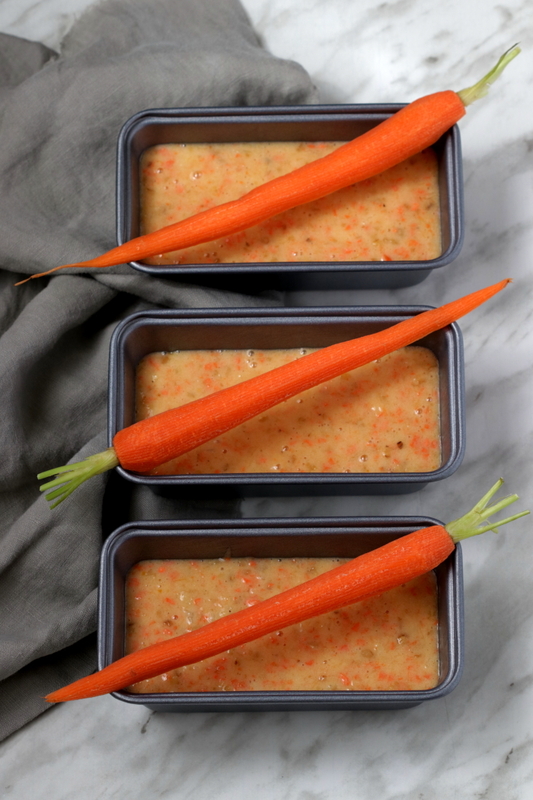 For a fun presentation, top the loaves with dutch baby carrot halves before baking. Just make sure to choose carrots slightly longer then your baking tin otherwise they’ll sink into the batter during baking. To give these mini loaves a pretty sheen, simply brush them with honey, maple syrup or some warmed apricot jam. I used mini baking tins which are 3×6 inches in size. However, if your tins are smaller the recipe will yield more mini loaves. Which ever size baking tin you use, just remember to adjust the baking time to accommodate the smaller ones. 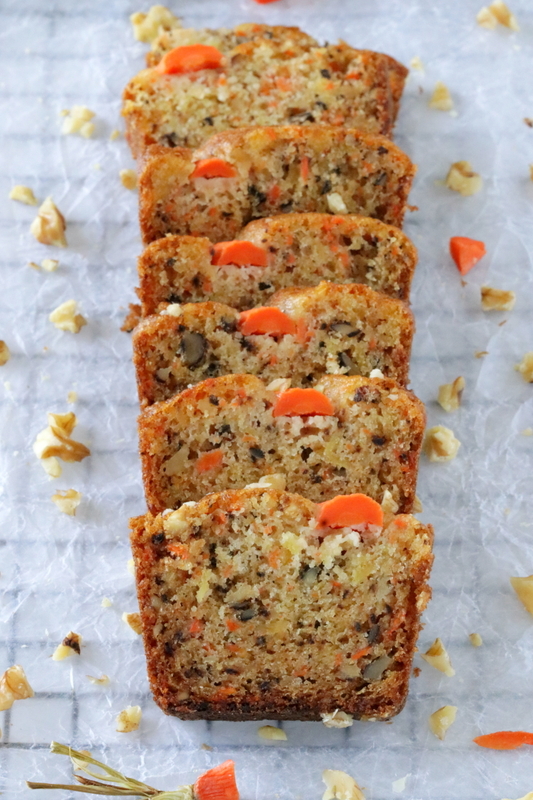 These moist and delicious gluten free carrot mini loaves with pineapple and walnuts make a great potluck dessert. They're also perfect to gift for that special gluten intolerant hostess. 1 14 ounce can pineapple, drained well and finely chopped A miny chopper or food processor will do a great job of this. I used 7, 3x6 loaf pans but if your mini pans are smaller this recipe will yield more. In a medium sized bowl whisk together the flour, baking powder, baking soda, salt and set aside. In the bowl of a stand mixer with the whisk attachment whisk together the oil, sugar and eggs until combined, for about 40 seconds or so. You'll want the eggs well incorporated. Add the dry ingredients to the wet ingredients and stir with a wooden spoon or spatula until combined. Fold in the crushed pineapple, chopped walnuts and the grated carrots. Do not over mix. Divide evenly into the prepared pans, filling the tins 3/4 full. 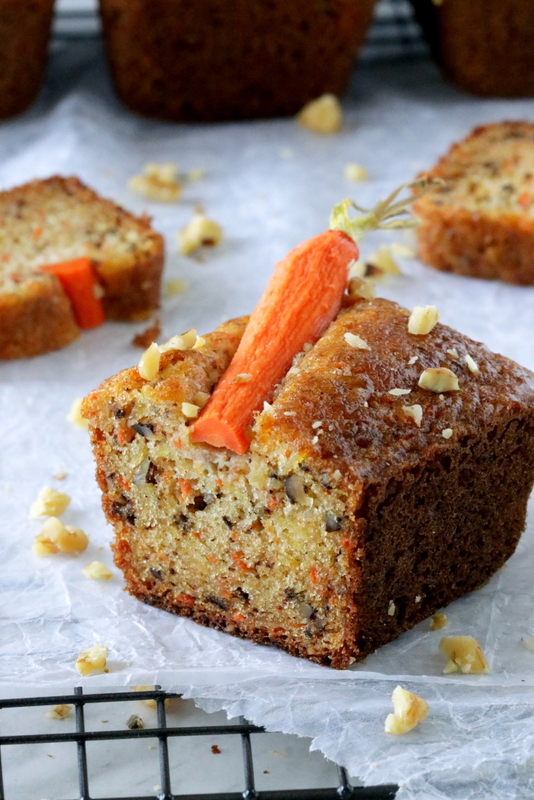 Place a carrot half diagonally over each loaf pan. (totally optional but so pretty when baked). Bake in the preheated oven at 325*F for about 30 to 35 minutes or until a wooden skewer inserted in the center comes out clean. Place the pans on a cooling rack and allow to cool for about 30 minutes before releasing them from the pans. To give them a little sheen, brush the loaves with some maple syrup or honey. Alternately you can brush the tops with some warmed apricot jam as this would also give them a lovely sheen. Make yourself a cup of tea and enjoy!